If you register for an account at w2beauty and spend over $30, you can receive an immediate $5 off. Use the sponsorship code (at registration) 26284308. I'm not one to wear nail polish often, and my friends know - I have a slight obsessive (and weird) tendency to peel off my nail polish after a couple of hours. 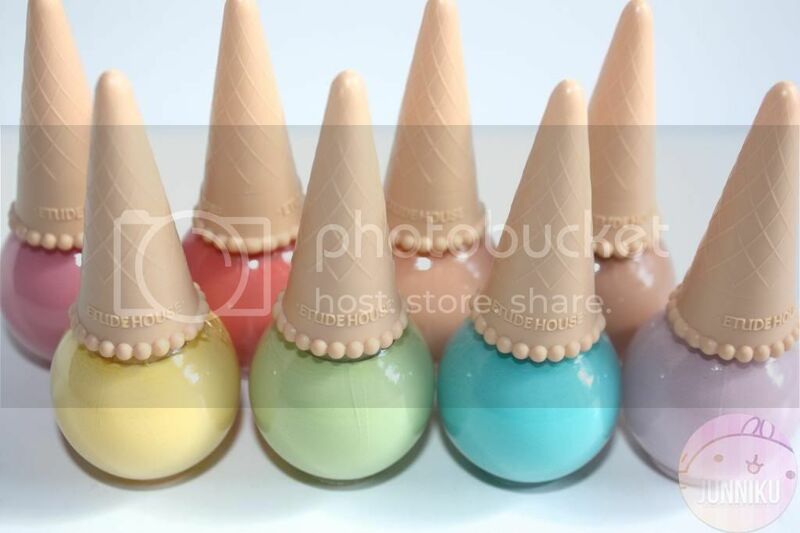 But some of the Etude House ice cream nail polish colours are so darn adorable, I've kept them on for as long as I could! I'll be reviewing the set today, a hearty thanks to w2beauty. Now on to the review! Huzzah! Click "read more" to see more pics + swatches! The packaging is way too cute to resist - the brush even has the texture of an actual ice cream cone! This is adorable, but the triangular shape isn't too practical to use. It's kind of awkward to hold in your hands. As for the brush, it's quite wide! It covers a lot of nail in 1 stroke, which I personally like. 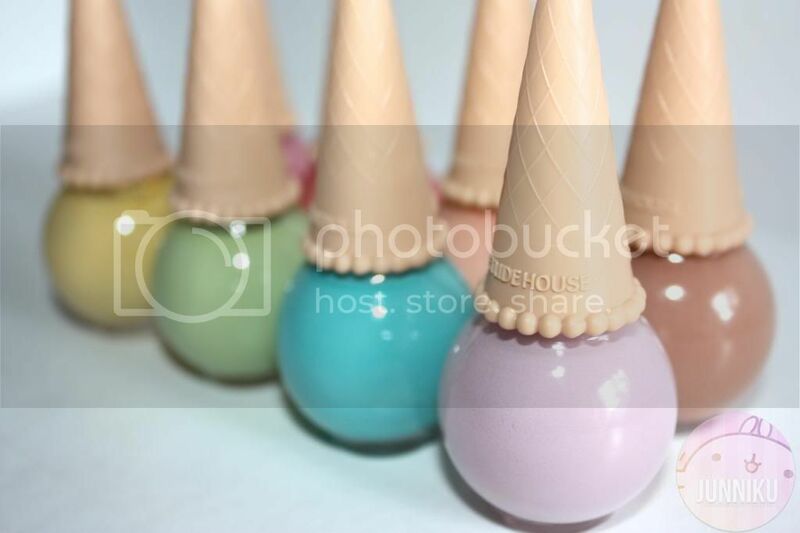 Each Etude House ice cream nail polish has 10ml of product! 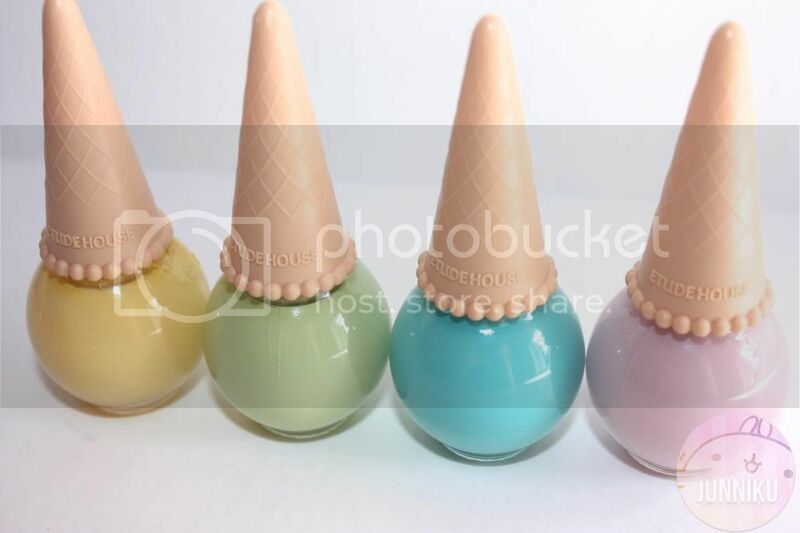 There are currently 8 colours in this particular Ice Cream line (Etude house also has several ice cream nail polishes that are sparkly!) These colours do not have any shimmer nor sparkles in them. The colours are quite bright and really pretty. It's a pretty "bubblegum pink" colour! It's a lovely, pastel, pink-peach colour! 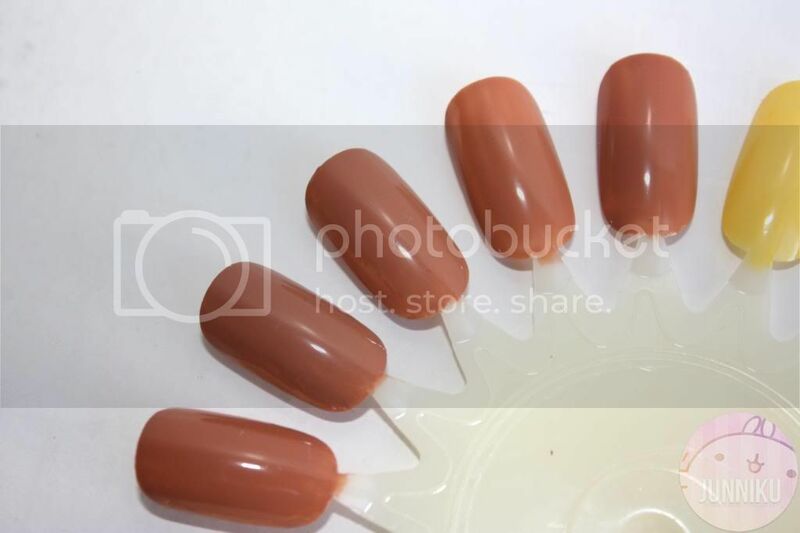 This colour reminds me of bronzer and beaches. It's a soft light brown colour. A pastel (but still bright) shade of yellow. It's a soft lime-green colour. This one reminds me of Essie's recent "In the Cab-ana", though they're not quite exactly the same. One of my favourite colours! A pastel lavender colour with a hint of blue tone. 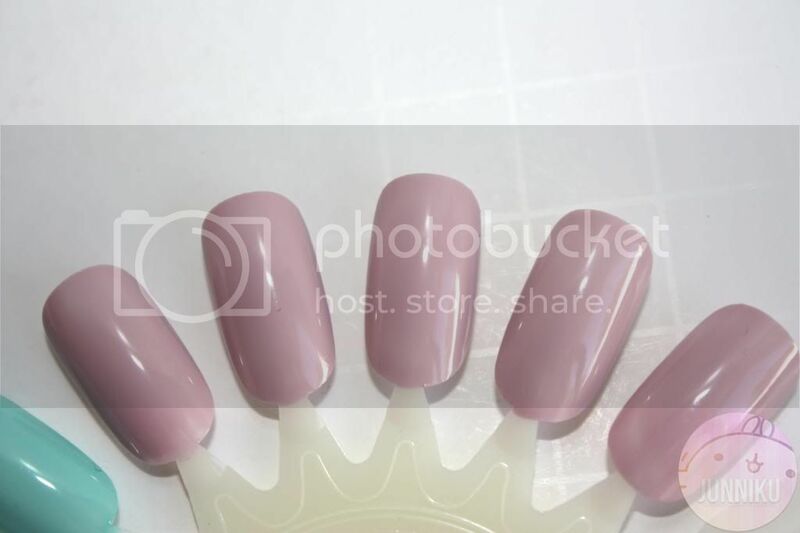 I've swatched the nail polish colours on the wheels below! Nail swatches for these polishes will be shown in upcoming NOTDs, and will be linked from this page. I adore the packaging, that's what first drew me to these polishes! Whoever designed this must be the Einstein of marketing, because this is brilliant. There are drawbacks to having such packaging, though - the brush and overall ease of use is affected. As mentioned above, it's quite awkward to hold in the hands and may take a few uses to get used to the unusual brush handle. The brush is wide, so it covers a lot of "nail space" in one swipe. As for the polish itself, I got a full application in 2 coats. The first coat would be a bit goopy, streaky looking and uneven, but the 2nd definitely smoothed things out. It also dries quite fast. The polish latest 4+ days without chipping, which is pretty fair in my books! I did like the colours! They're all very pretty, and creamy looking. Even though I do like a bit of shimmer in my polishes, I do like these even if they don't have any (I could always add a shimmery topcoat or something). 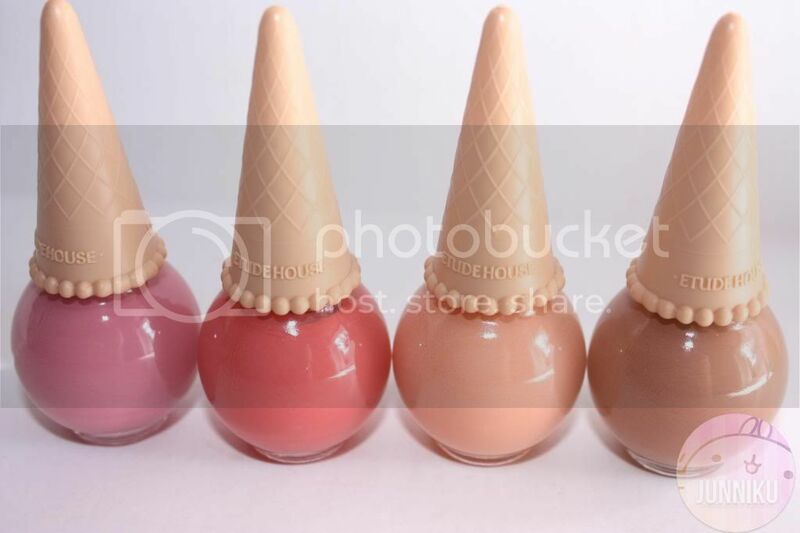 I hope Etude House comes out with more creamy looking nail polish colours like these, I would actually really look into buying some different colours. There is definitely a difference in quality between the Etude House nail polishes and other brands (such as OPI), but it still isn't bad enough to really comment on. It's fair, and I can live with it! The only thing I don't like about this polish is its unusually strong, chemical smell. My experience with w2beauty has always been excellent - I've been so happy with their service that I've added them to my "where to shop" page (a non-sponsored page). Alice, the shop owner, is one of those genuinely nice, trustworthy people. I would absolutely recommend shopping from w2beauty, it's one of the 2 Korean cosmetic shops I will personally shop form. I wouldn't repurchase these because I have enough - but I'd definitely look into buying different colours if Etude House comes out with more peachy/pink colours (I need me some more of those) + shimmer! I love shimmer. Disclaimer: These products were sponsored for review purposes. As always, this review is 100% honest. My opinion cannot be bought. This post contains an affiliate link. they're true a pretty cute color~ too bad I ain't use nail polish..
Omg they're all so sweetie♥ Cute:-) Fantastic colors! It would be fun to have these just sitting on display on the vanity though. Blue mint is gorgeous! You should try the peach/pink ones from the Look At My Nails line, reviewed heavily on my blog haha! I have the blueberry and the grapefruit :) I like them a lot!! they are just so cute!! What a great review. I can't believe how cute these are - classically Korean! CUTEEEEEEEEE. the colours are amazingggg! I actually want to give each one of them a try :p but I've also read the-not-so-good reviews about its consistency and of course its cute handle, being not so practical when it is used. 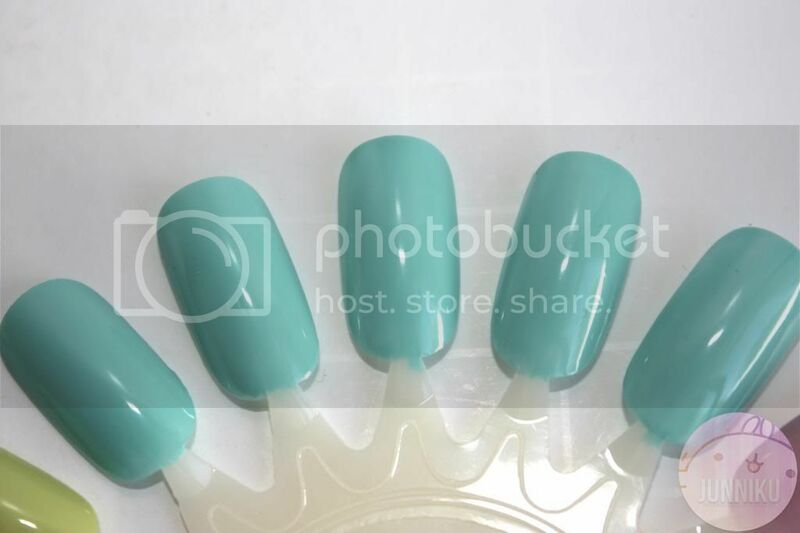 Well, when you mentioned blue mint and blueberry are the easiest to apply, I am thinking to buy these first before deciding to buy the other colours :3 Thank you for the review! I already have the blue one and now I know I need the peach shade too. So cute all together! Great job on the review beautiful colors. OMMGGG!! Thanks for posting!! Love the packageing and colors! 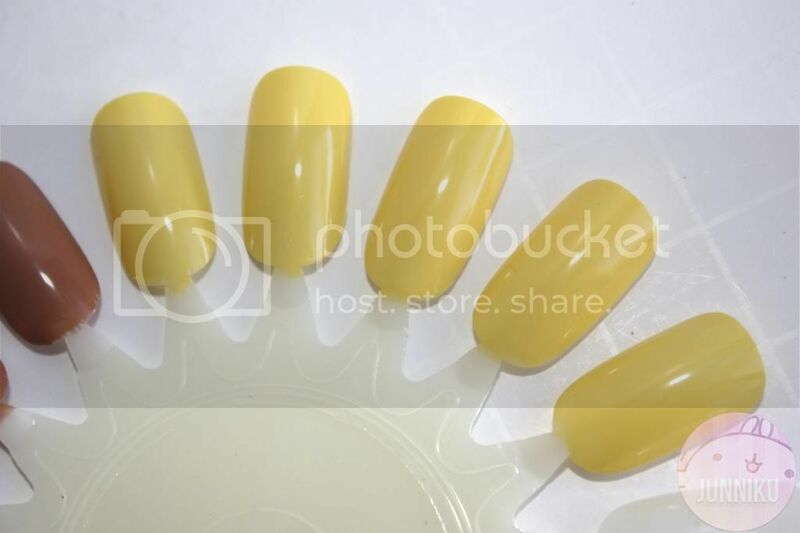 You swatches are amazing show what the polish look like! I like the picture where you shot the swatches together for the rainbow effect :D How can I get this in the USA? 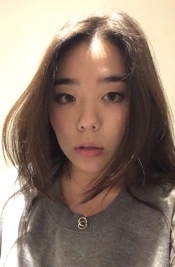 Heyoo! Hah, no problem and thank you! You can buy these polishes on w2beauty with free shipping - it comes straight from Korea. ^__^ (And you can enter "Junniku@hotmail.com" during your purchase to get a $5 reward off $30+ orders). We're so jealous! They look amazing but they are not available here in Greece! These are so... cute ♥_♥ The packaging and the colours! I adore that pink and brown. They are sooo cute!! I have to have these! I own a few of these and I absolutely love them! My favorite color is the blueberry purple shade :) I'm a sucker for colors like those tbh haha! These are the cutest! I want all of them! I should have had my oppa pick them up for me in South Korea while he was there, but now I have an excuse to do some more online shopping! I need more shades like peach! Besides wearable corals and peachy nudes I'd love to have more blues and teals! But I'm not really wearing much polishes nowadays. The packaging is soo damn cute! I definitely want all of these. I personally prefer my polishes without shimmer so these are perfect! Great review as always! I definitely have to get my hands on some of these. wow, they look sooo cute. 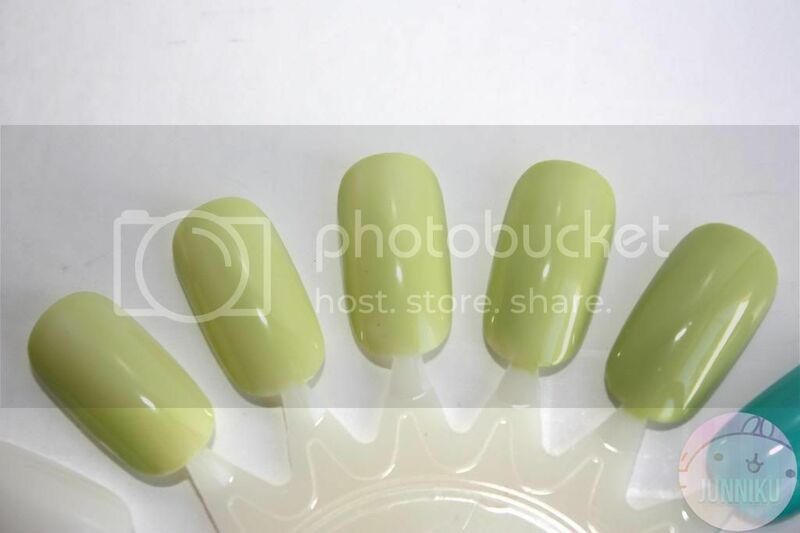 Even though I don't like to polish my nails (b/c I bite my nails a lot :P), I feel like buying this set so badly!!! This is the type of product I could buy only for its packaging. This is just so sweet! It makes me wanna try it all! These look to good, I wish they sold them where I live, your blog is really nice as well! the packaging of these nail polish is so cute!! OMG these are soooo cute! I'm totally going to buy them!!! I like the blue mint nail polish.